The Girls’ Littleton High School basketball team played against the Legend High School Titans this Wednesday night on January 16. 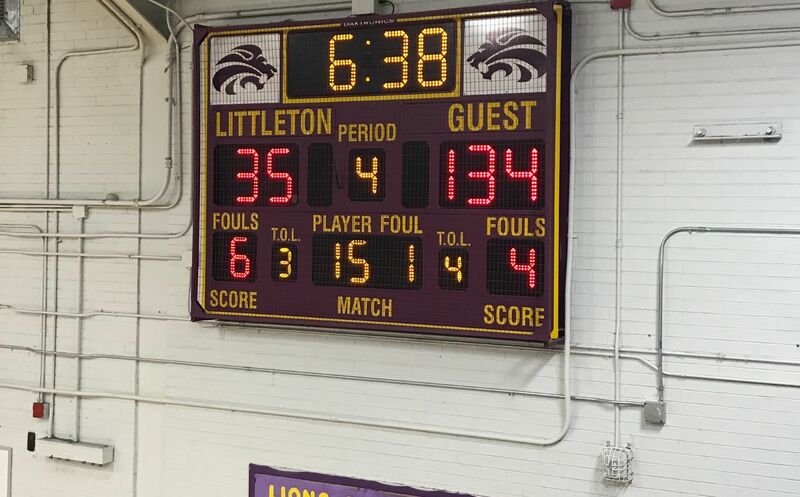 To start off, the Littleton versus legend game was a disappointment to state the least, with LHS losing against legend 35 to one 134. Only a little more than six minutes were left in the game, and it as fair to say that the Littleton Lions weren’t going to pull off this one. This would have been the case if the score had not been fixed. What began as a simple two point error, in which points were given to the wrong team, ended up becoming an error that took a good five to ten minutes to correct. Having operated a scoreboard myself in the past, I was surprised to learn that over one hundred and twenty points could be added to a team’s score in the blink of an eye. All satire aside however, the game was in fact very engaging and intense. Your own Littleton Lions fought hard for their victory, which was a solid 46 to 43. LHS was loosing for a firm part of the game. It was however almost like destiny that their motivation and skill take them all the way to the end. LHS initially struggled to get ahead, and was loosing 19 to 24. The Lions went above and beyond however when they gained the lead, and the struggle became a triumphant and meaningful one. Littleton won in what seemed like one of the longest fourth quarters of a basketball game in LHS history. There were plenty of fouls and timeouts called that caused the end of the game to drag on, only adding to the tension and excitement. “We’ve been on a bit of a losing streak, so I think I was definitely motivated to beat a team who we didn’t really expect to beat, and surprise everybody,” said junior Susie Puchino. The Girls’ basketball team did an excellent job at this. While the crowd was a little mundane at first, once our girls started making good plays and subverting expectations, they came out on top. “We just had more confidence that usual…I think we made big plays on defense and then it transferred over to offence. It was just good energy,” said junior Eleanor Fuchs. Good energy that just about the entire Littleton crowd picked up on. Our team played well, and everyone should go out to support them for their next game here at Littleton High School.